The Supporting Practice in the Arts, Research and Curricula (SPARC) Knowledge Engine provides data and insights to help clarify, define, and highlight the role of the arts and design in the future of higher education. Access to these articles is just one benefit of ICFAD membership. Members are respectfully requested to log in to read the articles. Non-members are invited to join, by clicking here. 2009 ICFAD Fundraising Survey In the fall of 2009, ICFAD conducted a fundraising survey of its members. Fifty-four arts deans responded and the results are compiled into a report. Review of this report is a benefit of ICFAD membership. Alumni of the Arts are often happier than most. Among findings of a recent SNAAP survey of more than 90,000 alumni in the arts from hundreds of institutions of higher education is that they are more likely to have learned “soft skills” – persuasion, networking, project management and working with the community. Arts Education Fuels the Economy In December 2013, in partnership with the National Endowment for the Arts, the U.S. Bureau of Economic Analysis released preliminary estimates from the nation's first Arts and Cultural Production Satellite Account. The account is meant to trace the relationship of arts and cultural industries, goods, and services to the nation's ultimate measure of economic growth, its gross domestic product. Review of this report is a benefit of ICFAD membership. Arts Students in Debt: Concerns,Consequences, and Interventions While there are many educational and experiential benefits to attending professional higher arts education programs, students who incur excessive student loan debt during their studies may experience unanticipated or poor professional outcomes either over the course of their artistic careers, shortly after the expiration of a loan grace period, or after they can no longer defer payments. To date, little to no research exists on the effects of an excessive student loan debt burden on professional arts careers. To address this gap in the higher arts education literature, and in an effort to facilitate scholarly discussion on the topic, this article identifies concerns, consequences, and potential interventions. Barriers to Recognizing Arts Entrepreneurship Education as Essential to Professional Arts Training While many professional arts training programs prepare students to excel at the practice and performance of the arts, evidence suggests that many professional arts training programs may be failing to prepare students to be professional artists. Cynicism in Higher Education. To what extent does cynicism negatively impact the productivity of your unit? This document acknowledges the pervasive effect of cynicism in academe. Drs. Nick Andreadis and Margaret Merrion, Professors Emeriti, Western Michigan University, offer a four-step process for leaders to help reduce cynicism and enhance trust in their colleges. The four-step process is illustrated within an example of academic program review which often prompts stalling, suspicion and resistance. Deans Leadership Council Template The University of Florida developed this template for use in creating and/or repositioning Deans' and Directors' Leadership Councils in each college, with the goal of forming a network of leadership volunteers. The Delphi technique helped surface more than one-hundred predictions that the panel of experts agreed were likely to occur. Collectively the predictive data portray a daunting, challenging and attractive future. The data have been transcribed into a scenario format for a coherent summary of changes anticipated in the arts in higher education. Review of this report is a benefit of ICFAD membership. Executive Data Exchange 2016-2017. Executive arts administrators from 59 institutions of higher education, 74 percent public and 26 percent private, share information about organizational structure; goals and priorities; budgets; responsibilities of staff; and more. Executive Data Exchange 2015-2016 Formerly known as ICFAD’s Salary Survey, but expanded to include so much additional information that we changed its name. Facilitating Difficult Conversations in the Classroom Students often bring up difficult issues in class. We and our students are experiencing the events in the Middle East; police use of excessive force; shootings in churches, schools, and movie theatres; the intensifying immigration debate; racism and genderism; and whatever turns up in the morning’s news. It is important to hone our skills in facilitating difficult conversations in the classroom. This handbook is written by faculty for faculty. Moving into Action The Next Steps for the Future of the Arts in Higher Education. In 2009, ICFAD members identified specific actions we, as leaders of Arts in Higher Education, could take on our local campuses that would accelerate the positive predictions and diminish the negative predictions of the 2008 Delphi project. Review of this report is a benefit of ICFAD membership. NEA research on employment data for full-time and moonlighting artists What are the latest employment figures for working artists—both full-time and their moonlighting counterparts? Keeping My Day Job: Identifying U.S. Workers Who Have Dual Careers As Artists is the third installment in the National Endowment for the Arts' Arts Data Profiles, an online resource offering facts and figures from large, national datasets about the arts, along with instructions for their use. Arts Data Profile #3 reports on employment statistics for U.S. workers who name "artist" as their primary or secondary job. 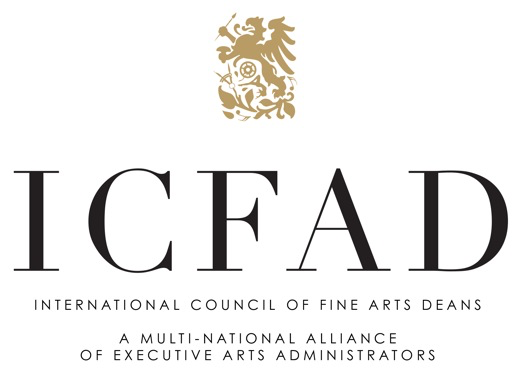 Review of this report is a benefit of ICFAD membership. The Future of the Arts in Higher Education: An Opportunity for Anticipatory Leadership Based on the Delphi study released in 2008, members of ICFAD updated the forecast for the future of the arts in a survey conducted during 2013. This report is based on a presentation made at the 2013 ICFAD annual meeting in New Orleans. The forecast for 2018 represents the best thinking of 22% of the North American membership, and provides the profession insights to lead strategically today in order to be prepared for the challenges and opportunities of tomorrow. Review of this report is a benefit of ICFAD membership. Members are respectfully requested to log in. Our appreciation goes to the author of both reports, Margaret M. Merrion, Dean Emerita, Western Michigan University. To Move Forward: An Affirmation of Commitment to Arts Education (2001), a collaboration of the Consortium of National Arts Education Associations, the International Council of Fine Arts Deans, and the Council of Arts Accrediting Associations. Review of this report is a benefit of ICFAD membership. Transnational Initiative Projects TIP (2005) was designed as a two-year investigation for which projects were competitively selected from members of ICFAD, the European League of Institutes of the Arts (ELIA), and other international venues. The committee reviewed applications and select projects were identified as representative of the tenets of the initiative. This publication provides an overview of each project. Review of this report is a benefit of ICFAD membership. ICFAD publishes documents and position papers, both unilaterally and in conjunction with other organizations.